If you’re a parent who also happens to love riding motorcycles, you might feel a little conflicted about having your children ride with you. While you may want to share your love of these machines with your little ones, you also instinctively put their health and safety above all else. Luckily, these two things don’t have to be mutually exclusive. You can take your kids for rides on your motorcycle safely as long as you’ve taken the necessary precautions in order to do so. To show you how this can be done, here are three safety tips for taking your kid on a motorcycle ride with you. 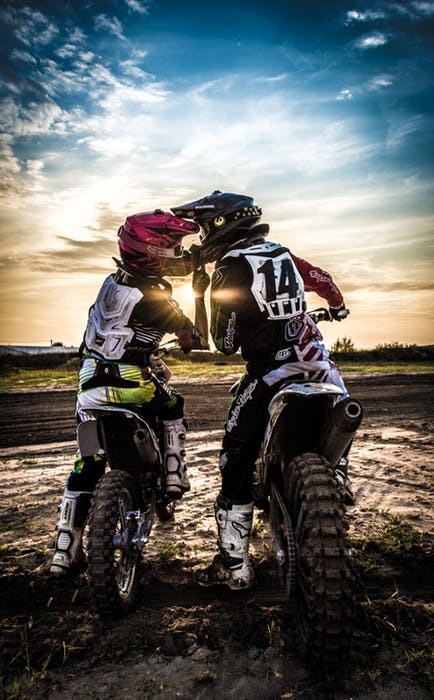 Before you put your kid on your motorcycle with you, you first want to make sure that he or she is physically ready for this adventure. According to Emily Green, a contributor to WorkingMother.com, your child is only physically big enough to ride on your motorcycle when his or her feet can safely reach the passenger pegs on their own. Until this time, your kids is still too little to ride with you. Once he or she is able to put their feet firmly on those passenger pegs, it’s now to time consider the safety of the conditions. If the roads are wet or driving conditions aren’t the best for whatever reason, today might not be the best day to take your kid out on a ride with you. If you’ve decided that your child’s big enough to ride with you, you now have to get him or her prepared with the right safety gear. Arguably the most important piece of safety equipment your child can wear on a motorcycle is a helmet. However, the helmet you wear is going to be far too big for your child to wear. And according to Art Friedman, a contributor to Motorcycle Cruiser, a helmet is only worth its weight if it fits snuggly. Additionally, make sure the helmet you choose for your child has a chin strap and that it covers as much of the face as possible. Once you’re ready to start your ride, it’s important that you always have your child sitting behind you. According to Motorcycle-Central.com, not only is it illegal for you to have your child sit in front of you on a motorcycle, but it’s also very dangerous. Having someone or something between you and the handlebars can make it harder for you to safely steer and maintain control of the bike. Because of this, passenger, including your kids, should always sit behind you. To have a safe motorcycle ride with your child, consider using the tips mentioned above to help you prepare together.